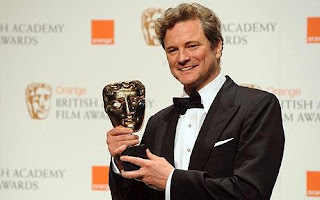 Great night at the BAFTA awards ceremony with my favorite Colin Firth wining the best actor award for his role in the film 'single man' directed by the equally good and different Tom Ford. Vanessa Redgrave also gave a strange 'performance 'when she accepted the fellowship of the academy. It was strange how this ex republican lady bowed to Prince William, who is now the President of the Academy, when accepting the award and the honour. Vanessa is of course known for her rebellious nature. Prince William also did well by looking very normal and humble and for trying to stop Vanessa from humbling herself too much. Wasn't too impressed with her long winded speech but then she was clearly in shock!